Today’s fight will witness a total of 12 rounds in the welterweight championship to win the bragging rights over the other. In their first fight, the 32-year-old Bradley got to win the WBO Welterweight title as a result of judges’ split decision in 2012. However, after that, a lot of demand came in for their rematch. In it, Manny won unanimously and thus got the title back. The match full of hatred will settle down everything on April 9. It will be interesting to see whether Pacquiao, the eight times world title holder retires as a real champion or Bradley takes over him and comes out to a better fighter as he is currently regarded. In the pre-official fight, both the boxers found out to be 145.5 pounds each. Before the match, but after the weigh-in, Pacquiao told TheReporterTimes the following. As of now, Pacquiao can appear to be slower as compared to his prime. It is all because of the age factor. However, the boxer from the Philippines has confirmed to give his best in the fight as he did try in the game against Floyd Mayweather Jr here at the same venue earlier. Pac-Man tried his best, but the American defended the punches and hooks with energy, style, and enthusiasm. As a result, he got a unanimous victory. After the fight, Pacquiao had a rotator cuff surgery and recently, he was caught in a controversy for comparing homosexuals to animals. 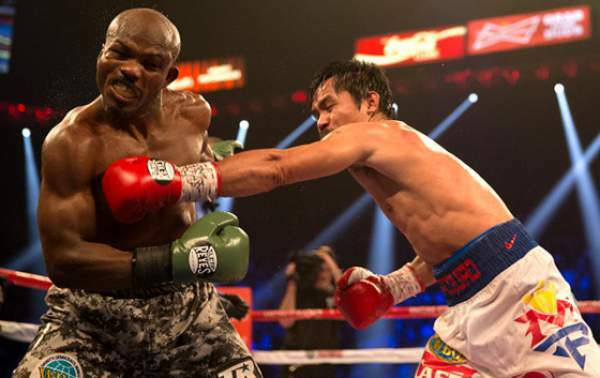 Prior to the big fight, the footage calls Pacquiao as the champion, but it shouldn’t be forgotten that Bradley is a former light welterweight title holder as well. He would want and do everything to capture the attention. Bradley made the following statement. Bradley vs Pacquiao is to start at 3:30 am IST or 6 pm ET / 3 pm PT onwards. The US residents can watch the championship fight on HBO while the option to live stream it is on HBO and TopRanktv. For the viewers living in Canada, they can catch it online on Sports Net. For the audiences residing in the UK, they can catch the live updates on Premier Sports and can get the radio commentary on TalkSport 2. Moreover, they can watch it live on Premier Sports. However, the even will not have any live telecast in India. But, Indians can watch it online on HBO YouTube channel.